Secrets of Baby Behavior: Does Avoiding Cow’s Milk While Breastfeeding Change Baby Behavior? Does Avoiding Cow’s Milk While Breastfeeding Change Baby Behavior? Breastfeeding mothers restrict milk in their diets for a variety of reasons. They may think that eliminating milk or other allergenic foods from their diet can improve their baby’s crying and frequent waking behaviors or reduce risk of allergies. Parents may hear stories of maternal milk restriction improving a baby’s crying and/or “colicky” behavior. (Mannion 2007) Let’s take a look at the facts. The sugar present in cow’s milk that is sometimes linked to allergies is also present in breast milk. Thus, eliminating milk from the diet of the breastfeeding mother will not drastically change the amount of these milk byproducts in the breast milk. Babies’ digestive systems already have the enzyme needed to break down the lactose, or milk sugar, as well. Gas is a normal side effect of digesting lactose in babies! There is no need to eliminate milk from the mother’s diet for “lactose intolerance” because lactose is naturally in the breast milk. True lactose intolerance does not develop until later in childhood and babies are not allergic to lactose. A true cow’s milk allergy is an allergy to the protein in cow’s milk, and occurs in 7.5% of infants. In exclusively breastfed infants, the incidence rate is 0.5% and it is thought that the protein in cow’s milk is transferred to the infant through the mother’s breast milk. (Denis 2012) With this allergy, you would see increased crying and night waking due to pain, but you would also see some obvious symptoms such as rash or hives and/or blood or mucus in your baby’s bowel movements. If you see any of these symptoms or suspect your baby has an allergy, call your doctor. Breast milk contains many antibodies that protect your baby against allergies, ear infections and many other diseases. More research is needed to determine without a doubt whether cow’s milk intake in breastfeeding mothers indeed may cause allergies in at-risk infants and whether it affects changes in baby behavior, such as crying and more frequent waking. If you are breastfeeding and have a history of food allergies in your family, talk to your doctor, especially if the symptoms listed in paragraph 3 above occur in your baby. Even if mothers avoid allergenic foods, prevention of food allergy was only seen for the short-term (Mavroudi 2011) and Denis et al recommends that mothers not restrict diary as a means to prevent allergies in their babies. Mavroudi A and Xinias I. Dietary interventions for primary allergy prevention in infants. Hippokratia. 2011;15(3): 216–222. Denis M, Loras-Duclaux I, Lachaux A. Cow's milk protein allergy through human milk. Arch Pediatr.2012;19(3):305-12. Mannion CA, Gray-Donald K, Johnson-Down L, Koski KG. 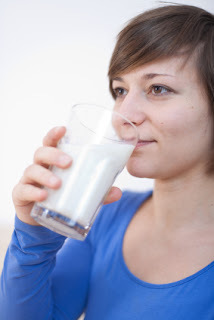 Lactating Women Restricting Milk Are Low on Select Nutrients. J Am Coll Nutr. 2007; 26(2): 149-155. I had to stop drinking milk (switched to soy) when breastfeeding because of my child's excessive night wakings, mucous stool, and kicking and crying out with wind pain. It was like a switch when I stopped she was completely better. It took her first 5 weeks to try cutting out dairy. I would occasionally try a cheese pizza now and then and deeply regret it overnight. Gradually she became more tolerant of things and now as a 14 mth old can have yogurt and cheese, but still must drink soy milk, too much dairy tips her over an edge. I'm sure she will eventually grow out of it.